When I first heard about the Elephantshoe ‘I Love You Box’, I knew I had to get it! This is so far up my alley, it’s past the alley, past the main street, past the suburbs and past the outskirts of town… I love stationary, I love crafty products, and I love subscription boxes. At some stage I was subbed to Glossybox, Rubybox and Glambox all at the same time. I cancelled my Rubybox subscription because, to be honest, I just don’t think it’s great anymore. I found in the last couple of months of my subscription, they just kept sending out the same things over and over again and some things weren’t really suited to my skin type (or hair type / colour) and that’s why I stopped doing the review blog posts on the Rubyboxes too. It’s called the ‘I Love You’ box because if you whisper Elephantshoe, it looks like you are saying ‘I love you’ – how sweet! 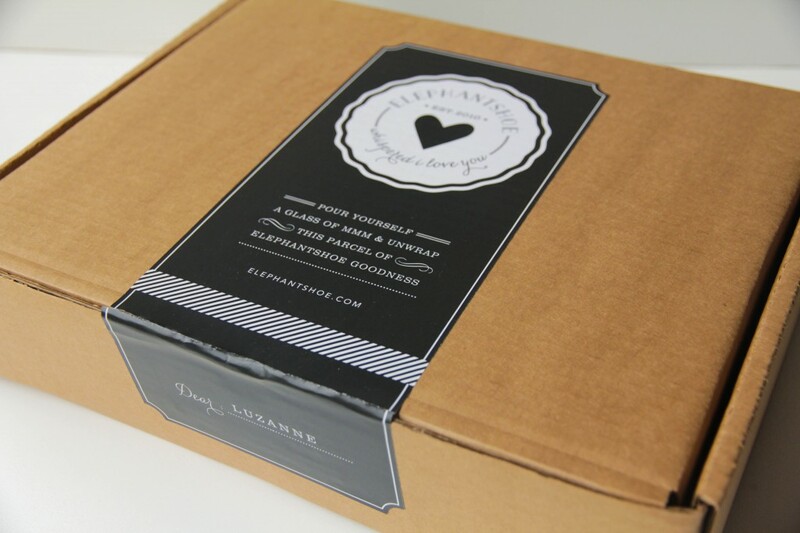 This subscription box is very different to most other subscription boxes out there, because whatever can be designed in this box IS designed by the lovely Samantha Schwikkard (founder of Elephantshoe), everything else is hand-picked and beautifully wrapped. One can see the love, time, effort and care that goes into compiling these boxes, it’s definitely not your typical mass-production subscription box type thing. As you can see everything is beautifully wrapped and tied with a gorgeous ribbon which you can use for crafts or next time you wrap a gift for a friend. The first thing that caught my eye was the Tattly tattoo, it’s an adorable temporary tattoo that reads: ‘live today’. One of my new year’s resolutions is to not sweat the small stuff, live in the moment – so this is perfect for me! Tattlys are made in New York, are non-toxic and printed with soy based inks. Plus they are FDA approved, so definitely safe for adults and children. I think I’ll transfer this one onto my wrist. 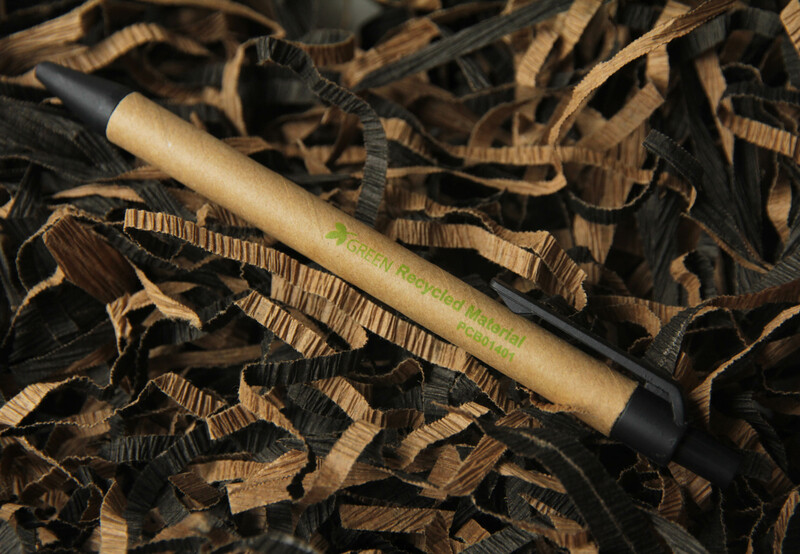 Next up we have a black ballpoint pen made from recycled material. Now the next couple of items really had me excited and I was super impressed and happy to have received them. 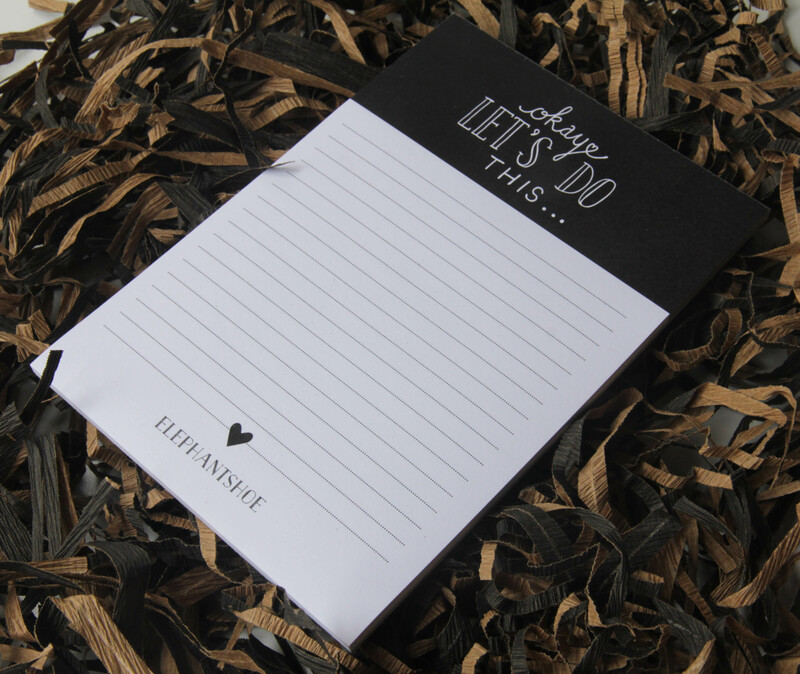 First up we have a 30-page ‘Okay Let’s Do This’ notepad, perfect to make your daily lists on (I’ll be using mine to remind Neal of all the things he needs to do around the house – haha!). Another new year’s resolution of mine is to manage my time more effectively (and efficiently), and making lists plays a big part in accomplishing that. 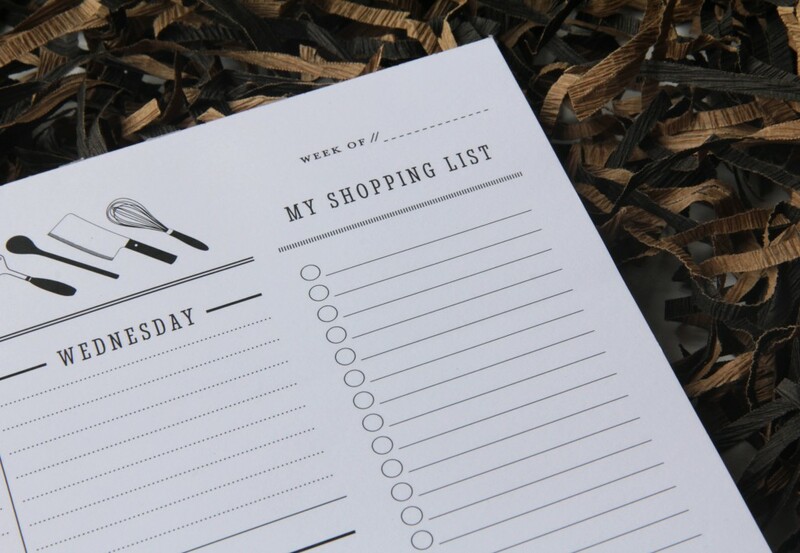 Then we have an absolutely fabulous 52-page weekly planner pad, printed on an A4 landscape-style. 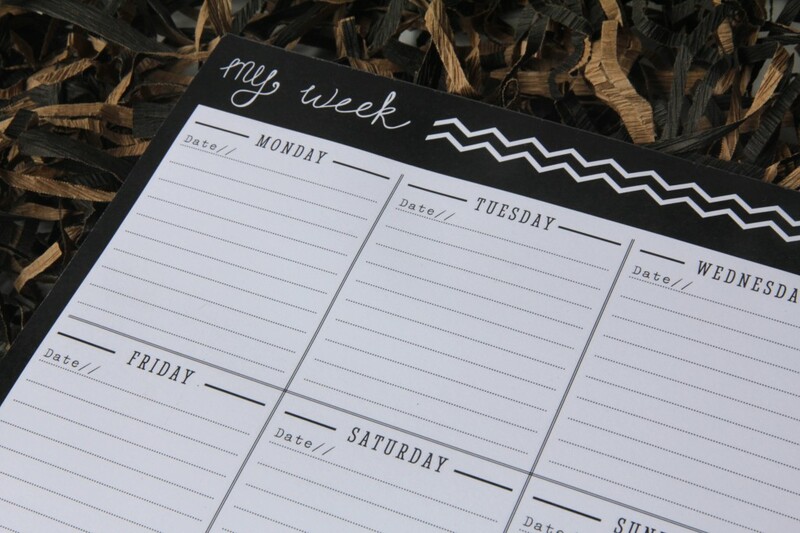 What I love about this, is there are no dates on the pages, so you can add your own date for any specific week. And if you don’t use say a month’s worth of pages, you are not wasting at all because you can just pick up where you left off. I’m using this one for work because I usually have quite a number of meetings during the week and the nature of our business, means I have to keep my wits about me ALL. THE. TIME. Next up we have something that brought a smile to my face because it is EXACTLY what I have needed for the longest time. 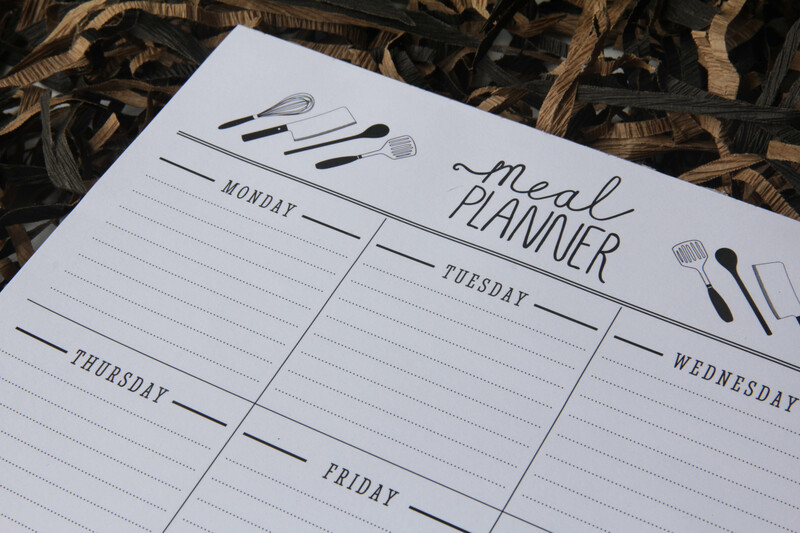 It’s a 52-page meal planner pad and this one also doesn’t have specific dates so you can use this whenever you want and not feel like you are wasting because you skipped a week or two. This planner pad is also an A4 size, printed in landscape. I feel like my whole adult life has been a fail (dramatic much?) because I have wasted so much time, energy and money on basically not planning my meals. I gained weight because I became lazy and ate junk food in my late twenties – let’s face it, junk food (or a ready-made meal) is so much faster than going out to the shops to buy healthy food and then prepping the food and then cooking a meal. But that’s exactly it, it’s not healthy and it packs on the pounds. Planning your meals every week (I do this on a Sunday) makes your life so much easier because you know exactly what you need to buy for the week. This is how I used to do my shopping, I would never plan my meals and go do our weekly shopping at Woolies. I’d go balls to the walls and just buy random stuff (usually way more than we needed for the week) and we never got through everything and I ended up having to throw away fruit / veggies that had gone off / stale / vrot. So planning your meals not only saves you money but also gives you time to try out new recipes, and I find I try to be more creative with the meals, if I plan them beforehand. I am so impressed with the January 2014 I Love You Box, especially since most of the items in the box was illustrated and designed by Samantha. I am really looking forward to the February 2014 box, I’m sure it’s going to be a Valentine’s Day themed box – eeeeep! 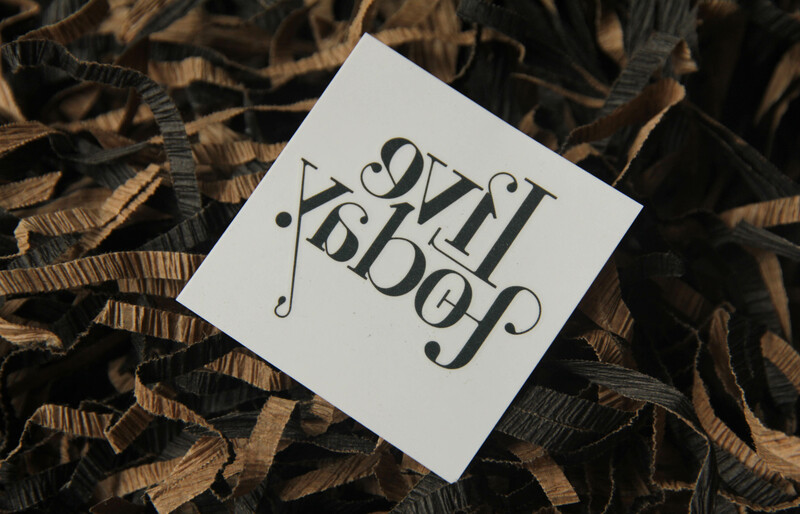 You can order the ‘I Love You Box’ here – they retail for R 250 per box per month. You can order the box every month or you can sign up for a 3-month or 6-month subscription. Oh! This is up my alley too as I am big into crafting and stationery… And I love how so much thought has been put into the making of these boxes. I need to order one asap! Thanks for introducing all your readers to new things, Luzanne. I love the look of this box. Thanks for sharing! I also plan my meals weekly and have found I saved loads of time and money. I do a big shop every 6 weeks to stock up on basics – fish, chicken, meat, pasta, tins of tomatoes etc etc and then each week I just need to supplement with fresh veggies, milk and bread. It ensures variety and also that I can plan to be healthier. My one bit of advice? When you cook something like a cottage pie/ pasta sauce/ curry make double and freeze one full meal. Then those nights that you can’t face cooking (you will still have them), instead of reaching for the takeaway menu, simple defrost one of these pre-made meals. Sjoe, this is such a great idea. And the best thing is, its south african.. luv it! I actually cant get over how great your photos are, Luzanne They are so crisp and detailed. This looks fabby. I luv the look of this box and its filled with all those goodies. I must look into getting one of these, thanks Lu! Awesome awesome awesome box, Luzanne! Must get my hands on the next one as Im obsessed with crafty, stationery-ish things too. I always look forward to reading your blog posts because I know its going to be something interesting and different. You are one of my top favorite beauty bloggers..